In my earlier article Reasons for skepticism about happiness research I mentioned some skeptical comments to research and publications about happiness (I'll paraphrase what I said there): (1) Happiness is important but the importance of happiness is exaggerated. Happiness should not be the ultimate life goal. It is of relative importance. There are many other things in life which are as important. Trying to maximize happiness is an unwise strategy, (2) Much research into happiness is correlational and does not allow for conclusions about causation of happiness. Still, the suggestion (or at least the interpretation by the public) of publications is often that when a variable correlates with happiness it causes happiness, (3) There are reasons to question the validity of self-reported happiness. Research by Sean Wojcik demonstrated that conservative generally rate themselves as happier than democrats but appear unhappier when assessed through two objective methods (text analysis by language processing software and expert-rated genuineness of smiles). A new study by Ponocny et al. (2015) gives extra reasons to doubt the validity of self-reported happiness. 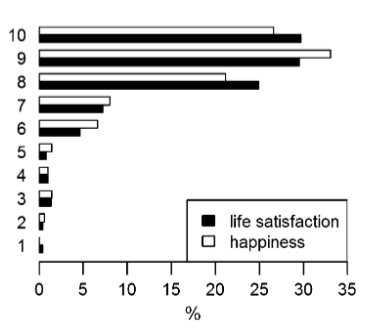 In the study respondents (n=500) were asked to rate their (1) overall life satisfaction, and (2) happiness on a 10 point scale. Then they were interviewed about good and bad experiences and about several aspects of their lives. Their answers were then rated by 12 raters on a 11 point happiness scale. There turned out to be sharp discrepancies between self-reported happiness of respondents and what they had said during the interviews. In the interviews they tended to be much more critical about their lives than their self-reported happiness scores suggested. 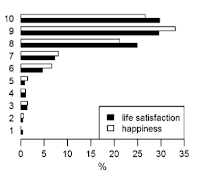 This study strengthens my skepticism about the value of self-reported happiness. How well can we express in one rating how happy we are or how satisfied we are with our lives? How can we do justice in that one rating to the great variety in experiences and feeling we can have? How well does that one rating do justice to the many fluctuations there may be in how happy and satisfied we feel? How can we know that this one rating isn't distorted by several response tendencies, such as social desirability (the tendency to present oneself in a way which seems to expected and appreciated) or the reference group effect? And how can we know to what extent that one rating isn't determined partly by self-deceptive enhancement or a form of inner pep-talk ("I will not allow myself to admit to myself that I don't feel very happy so I'll give myself a high rating").